(CNN) - It seemed real; it seemed fake; it seemed real again; now we’re back to fake. "It” is the controversial little scrap of papyrus, written in Coptic, that seems to have Jesus referring to “my wife,” in contrast to the traditional stance that affirms Jesus’ perpetual bachelorhood. The quick backstory: In 2012, a Harvard professor, Karen King, brought this papyrus to the attention of scholars and the public. Both the material and the script looked authentically ancient at first glance, and though the notion of Jesus having a wife was remarkable, these “lost” Christian writings, such as the Gnostic Gospels, are full of unorthodoxies. It was good enough for King, who is widely respected in the scholarly world. From the beginning, there were doubts, however, beyond the unlikelihood that the tiny scrap that survived the centuries would happen to be the one that contained the reference to Jesus’ wife. The papyrus, along with a few other ancient papyri of lesser novelty, had been passed to King by an anonymous figure. Anonymity, in the world of antiquities, is often a bad sign, compounding the inherent uncertainty when dealing with texts that are bought and sold rather than discovered in a firm archaeological setting. Then there were aspects of the text itself that seemed suspicious. For a fragmented scrap of papyrus, it seemed to have an awful lot of important content on it. Not only did Jesus refer to “my wife,” he also potentially described a certain Mary – perhaps Mary Magdalene? – as “worthy” and capable of being a disciple. It is (almost) too good to be true. At the same time, the handwriting seemed surprisingly sloppy. Then again, other scholars noted that just because a scribe has poor handwriting and a text is informative does not make it a forgery. Perhaps we just got lucky this time. More specific issues arose in the perceived familiarity of the document. So close, in fact, that one of the typographical errors in an online edition of the “Gospel of Thomas” is replicated, uniquely, in the Jesus’ wife fragment. Yet some would say that the fact that there is considerable overlap with the wording of the “Gospel of Thomas” isn’t a problem: Christian authors regularly copied word-for-word from other texts. The canonical Gospels of Matthew and Luke, for example, reproduce much of the Gospel of Mark, with only slight alterations. And the vocabulary used in the papyrus is remarkably common. The most compelling argument for authenticity is the flip-side (or verso) of the manuscript. There are faint traces of ink on this side that have been worn away, suggesting that they are truly ancient. It would be highly unusual for a modern forger to get his hands on an ancient papyrus written on only one side and equally difficult to imagine how the verso might have been made today. Yet for all the arguments and efforts, there was no smoking gun - on either side. And so the papyrus was submitted for testing: carbon-dating of the papyrus itself as well as chemical testing of the ink. Just last month, those test results came back. It turns out that the papyrus is genuinely ancient. The ink has the chemical composition of ancient ink. The news spread, including here, that the papyrus was the real McCoy. Of course, tests like those can’t really prove authenticity; they can prove only potential authenticity. And they are hardly foolproof. Once we started carbon-dating papyrus, forgers started using authentically ancient papyrus. Once we discovered how to identify ancient ink by its chemical composition, forgers started creating precisely the same ink. Like steroids in sports, it’s safe to assume that the best bad guys are always one step ahead of the science. And yet, the dating of the papyrus and ink did shift the burden back on to the doubters. And just this past week, they seem to have discovered something as close to proof as we can really expect in cases like this. Although we knew in 2012 that there were other papyri in the same group that included the “Jesus' wife” fragment – the batch the anonymous donor gave King - none of them had been seen. That changed with the release of the test results, which used some of these other papyri for the purposes of comparison. One of those papyri was a fragment of the canonical Gospel of John. For all the uncertainty about the Jesus’ wife papyrus, this text of John evoked no such indecision. It is a forgery. How do we know? This Gospel of John purports to be a version in a relatively rare ancient dialect of Coptic known as Lycopolitan. 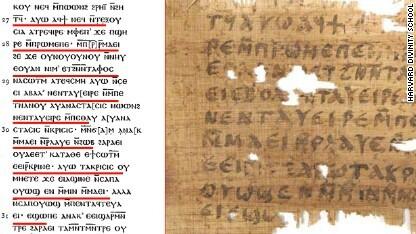 Herbert Thompson's "Gospel of St John," page 7 (left); Coptic John fragment recto (right), illustrating how a forger could have copied every second line of this text. Whoever created this new Gospel of John fragment simply copied the beginning of every other line from the online version. Turns out that if you check the other side of the fragment against its online parallel, the same thing is true (though with the end of every line rather than the beginning, logically enough). Add to this the fact that the carbon dating of the John papyrus puts it in the seventh to ninth centuries, but Lycopolitan died out as a language sometime before the sixth century. No one wrote anything in Lycopolitan in the period in which this text would have to be dated. So what does it matter to the Jesus’ wife fragment that this scrap of John is forgery? Well, it’s never a good sign for a text of doubtful authenticity to be found in the company of a sure forgery. More directly: Multiple experts agree that the fragment of John and the Jesus’ wife papyrus are written in the same hand, using the same ink and even the same writing instrument. Simply put: If one is a forgery, they’re both forgeries. Although 100% certainty is never achievable in such cases, given everything we know now (lab tests included), the “Gospel of Jesus’ Wife” never existed — or, rather, it never existed, for all intents and purposes, before 2012. There are no great revelations to be gleaned from this text, no astounding new information about Jesus or Mary. What the entire episode does, rather, is remind us — scholars included — that science might not always have all the answers. This forgery was detected not through lab analysis but through good old-fashioned humanities-based detective work. This was Sherlock Holmes, not "CSI." There remains no substitute for deep, thorough, scholarly expertise in ancient languages and texts. Even in a case that ended up wasting such time and energy in the academic community, that community, and its collective body of knowledge, have rarely been more valuable and necessary. Joel S. Baden is an associate professor of Old Testament at Yale Divinity School. Candida Moss is a professor of New Testament and early Christianity at the University of Notre Dame. The views expressed in this column belong to Baden and Moss. Whether this fragment is authentic or not, is of no consequence to the fact that Christ had a wife. Gospel of Phillips attests to the fact. Besides, the coptic scrolls recovered at Nag Hammadi confirm that. The mainstream Christianity may choose to believe otherwise, but those who care for the historicity of Jesus can NOT ignore these scrolls. "The Gospels that say Jesus had a wife are unreliable"
You can't say the gospels are reliable or unreliable. They are myths. Mere folk tales that are millenias old. The fabrication machine is working well I see, even if the spell/grammar check isn't. The gospels were written as late as 100 CE and no one knows by whom. John, Luke, Mathew and Mark were not written by John, Luke, Matthew and Mark. Every theologian knows this. And regarding them agreeing with each other, it depends what parts you read. If you compare the crucifixion and resurrection myth, they are way off. Just considering jesus' last words there are three different claims. If you want to waste your life based on what someone wrote two millennia ago who heard it from someone else who knew someone who lived at the time, knock yourself out. You should try Harry potter instead. Just as much magic without the guilt and much less bloodshed. They could not have written them because they were dead. John for example was writ.ten 80-100 years after jesus died. Even if you ignore this (which you have), as you said, no one knows who wrote them. Since the population of the world back then was about 300 million, you have a 1 in 300 million chance that the gospels were writ.ten by their namesakes. That of course as_sumes that you believe in magic. Regarding jesus' last words the gospels are clearly at odds with each other. The following verses describe different last words just before death or "giving up the ghost". I can t wait to see what verbal gyrations you come up with on this. The gospels have many contradictions when it comes to the resurrection myth. Who was at the tomb, were they inside or outside the tomb, what time of day were they at the tomb, what and who they saw at the tomb and more. Again, I can't wait to see the verbal gyrations. On the subject of guilt – you can go ahead and live with your "good guilt". I don't need artificial guilt to make me do the right thing. It is indeed a very crappy detective that takes 25 years to gather evidence. Kermit – for someone who can't put an intelligible sentence together, I have real difficulty believing you can comprehend what you read. In the bible or elsewhere. and how is it intelligible? Just that fact that you ask that question makes my point. Whether this fragment is authentic or not is of no consequence where the hypothesis concerning Mary Magdalene as the wife of Jesus is concerned. But then, the New Testament is full of proved forgeries and the very sketchy "first book" only dates back to no closer than 20-40 years after the claimed events in it. All the rest was added later. Great MIRACLES have been discovered in the BIBLE. It will change the World forever! How bout my wives in America? you guys have all the papers on them so i can sue them all for adultery when i get back!!!! LOL!